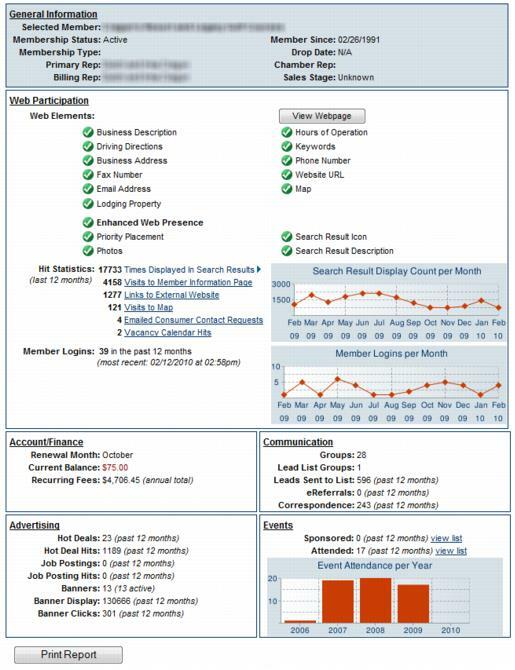 The Members module is the cornerstone of the Growthzone software application. Here you can view contact information, membership status, account balance, and many other details for each of your members. Access the Members module in the backoffice by clicking "Members" from the left navigation bar. To locate a member, click the drop-down arrow on the right side of the drop-down member list. Click the left or right black arrow to move quickly from one member to the next. Indicates the record number of member that is currently displayed out of the total number of members that are viewable with the current filter selection. Click filter options to choose which members should display in the Members drop-down list. Select a tab to view items unique to each member. See tab description below. Web: Member description and contact information that displays on the member information page, web participation level (basic or enhanced), member login name and password, web display attributes, member logo, photos and images. Communication: Displays communication history for this member; ability to log a call, print a label, send email or send an eReferral. Task Reminders are scheduled here. Lodging: Optional lodging information including facility types, lodging amenities, and vacancies. Only available if Lodging module has been enabled. Contact support@micronetonline.com to determine your options in regards to the Lodging module. Files: Area to upload files and documents that should be associated with a member. This is member-specific storage of files. E.g. Upload a member contract or agreement for reference by your staff. See Store member files on their record. Do you have documents like special agreements, member-specific graphics or other unique files that you'd like to keep handy with your member's account? Upload these files to the Files tab in the Members module so they are available for any staff member that needs to reference this material. Use this as a member-specific storage spot that is accessible by all staff. There are multiple ways to find a member, depending on what information you know about your member. When you know the name of your member. When you know only part of the member name. When you know the representatives’ name, Account name/ID, Phone/Fax, Email address, Mailing Address, or Business Category. Using custom criteria to look up by almost anything. By member name - Using the drop-down list box. Click the drop-down arrow to right of the member's name in the header bar. In the Member list, click the desired member name. NOTE: When the drop-list is displayed, you may begin typing the first letters of your members’ name to advance to that member automatically. You can also use the to move from one member to the next. If you have enabled Use drop-down lookup list that is optimized for a larger number of records in your general settings, a text-box will be displayed that will use type-ahead functionality that not only displays results that match the "start of the record" but also displays those that match 'any part of the record name". See General Settings for instructions on enabling this function. Click the Find button in the header bar. Enter Search Term: type the member name. Note: If you only know a portion of the member name, click Match any part of member name in the Match Options drop down list. In the Choose Member/Rep list, click the desired member name. Select Representative Name from the Filter Type drop-down list. Type the representative name in the Enter Search Term box. Note: If you only know a portion of the representative name, click Match any part of rep namein the Match Options drop-down list. Click the desired representative name in the Choose A Member/Rep list. Select the desired custom criteria. Click Continue. The >Members drop-down list will now display only those that meet your criteria. You can click the left and right arrows to move quickly through the selected records. NOTE: To return back to the full list of members, click filter options and select clear filters and click Continue. When you click Finish, your member is automatically added to the database. Enter all required member information. Note: An immediate warning will appear if trying to create a duplicate member. See more info. Globe icon – Click the globe icon to open an internet connection and test the website address that is entered. This will ensure that you have typed the address correctly if the correct page opens in the browser window. Call First – Check this box as a reminder for you to “call first” before sending a fax to this member. Check Use Physical Address as the Mailing Address if both the physical and mailing address are the same address. This will save time so you won’t need to type the address twice. Tip: The Mailing Address fields must contain an address in order to print labels for this member. Either type an address or click Use Physical Address as the Mailing Address. Click Next to continue. Step 2: Additional Information is displayed. Enter all required additional information. Here you may assign categories, representatives, membership types, web packages, etc. Click Next to continue. Step 3: Lodging (not available in all editions) will be displayed, select Enable Lodging for this member if desired. If not, click Next. 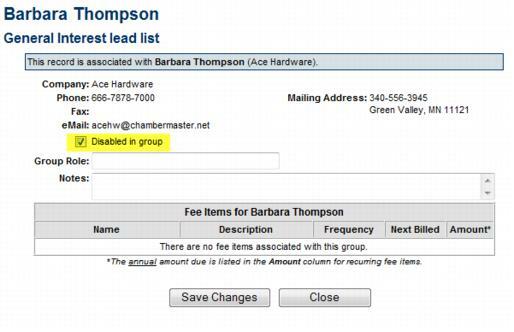 When Step 4: Billing Information opens, complete the desired fields and click Next to continue. When Step 5: Web Display Information opens, complete the desired fields and click Finish to complete the process. Click Finish, your member is automatically added to the database and included in the online directory (unless the Does Not Display on Web check box is selected). Note: Members can also be added by filling out the Membership Application form. If you have included a Membership Application form on your web-site. You can configure your system to automatically accept applicants as new members, or you can manually approve the applications. See Setup the On-line Application for further details on creating your on-line application form. Click Mbr Signups in the Task List. A list of the memberships awaiting approval will be displayed. Click the Member Name to view further information about the applicant. "Member chose to pay by credit card. Transaction successful": Pay by Credit card was chosen and completed successfully. "Member chose to pay by credit card. Transaction is being processed. Transaction submitted MM/DD/YY - HH:MM": Pay by credit card was chosen, credit card information was entered but never received a success message. Check credit card report for success/fail. "Member chose to pay by credit card. Credit Card information was not entered. ": This indicates the applicant selected pay by credit card but never even entered in their credit card information and closed out. The reason these still come through as an application is because it gives the chamber/organization the opportunity to pursue the member who might have just been too busy to complete the application. When you see the wording included on these messages saying receipt has been created or invoice has been created that indicates that a staff member has been processing that application and created the receipt or invoice from that application. Approve: This option allows you to approve memberships paid by credit card OR approve memberships where the applicant has requested to be invoiced without creating an invoice. Approve/Create Invoice: This options is only displayed if the applicant has requested to be invoiced (it will not be displayed if paid by credit card). When this option is selected, the applicant will be assigned as an active member, and the invoice will be created so that you may deliver it. Approve/Create Receipt: This option is displayed if the applicant has paid by credit card, and you wish to approve the application AND create a receipt for the transaction. Create Invoice Only This option allows you to create the invoice for the new membership. Select this option if your business process requires that you receive payment prior to activating a membership. Create Receipt Only: This option will be displayed if the applicant has paid by credit card, and you do not with to approve, simply create an invoice. Decline: Select this option if you do not wish to activate this new membership. The Application History tab is accessible when you click onto Mbr Signups in the Task List. When an applicant has been approved or declined, their information is moved in the Application History tab. Applicants remain on this list for 90 days where they may be viewed. At any time, this data may be exported to a CSV (comma separated value) file. This might be done to save the data for historical purposes, or to use as a source file in a mail merge, or for viewing and manipulating in other programs. Click the Application History tab. Type the desired name for this file. Select the desired file location. Members who are no longer participating may be dropped (set inactive) but still have their history and information available in the database. Members should only be deleted when history is not necessary or when a member was mistakenly created. Dropped members are still displayed in the Member drop-down list when the Filter Options are set to display Dropped/Inactive members. Dropped/Inactive members will display in red. On the member's General tab, click the Membership Status drop-down arrow in the Additional Information area. Click Dropped/Inactive. The Drop Member Options dialog box will be displayed. The Drop Date will default to the current date. You may change this if needed. Select a Drop Reason from the drop down-list. If needed click the Drop Reason hyper-link to add or edit drop reasons. Leave Unchanged (Active status) select this option if you wish to allow the rep to continue to access the MIC. The credentials to the MIC will be maintained. Set as Inactive status is appropriate for a rep who is no longer acting as a representative for the member. The rep’s information and history will be retained but there is a separate distinction given to them in reports and lists. Credentials to the MIC will be disabled. Delete a rep should be limited to a rep that was created by mistake. History and all reference to this rep would be removed. This is NOT recommended. Leave Unchanged status is appropriate if you wish the reps to remain active in groups (and receive email notifications). Disable in All Groups: Reps within a group are not visible in the group list on a regular basis and will not be included when selecting to contact these group members. Disabling a rep also preserves the history of their participation in this group. Delete From Groups: This option will delate a rep from a group, removes all record of their participation in the group. Note: Both active and inactive reps may be set as disabled in a group. Inactive reps, that are not disabled, are still included in emails sent to the group. Representatives that have a status of inactive will NOT automatically be returned to active status if a member is reinstated. Individual reps must be returned to active status on the Reps tab. Billing Information: The Current Balance for the member is displayed, you can manage open invoices on the members Account tab. Recurring Membership Dues & Fees: You may choose to remove the recurring fees schedule, however, if fees are removed from a dropped member’s record, the dollar value of the dropped member will not show on the Drop Report. Dropped members are not included in recurring membership billing even if fees are left on their record. NOTE: The [Drop Analysis Report] will provide you with statistical information about your membership drops. After an active member has been set to Dropped status, setting them back to Active status will display options to allow you to return reps back to active status and reinstate their group participation if desired. In addition, you will be prompted to reinstate individual Member Center Logins and Event Registration options if applicable. Member login permissions are also automatically re-enabled now in addition to their member page URL being reset to No Redirect Action. Find this new reactivate screen when selecting Active status on a member that is currently in Dropped status. Members>General tab>Additional Info area. Click Members in the left-hand menu and select the desired member to be reinstated / re-activated. On the General tab, click the Membership Status arrow in the Additional Information area. Complete the Activate Member window. If a member is reinstated you will typically want to set the Rep back to Active status. Check the reps on the Reps tab to verify their status after completing the Activate Member screen. Leaving Group Status Unchanged will leave reps disabled that were previously disabled in a group, and reps enabled that were previously enabled in a group. No change is made to the reps’ group status from how they were when they were dropped when selecting Leave Unchanged. If applicable, select the Member Permission Set that should be applied. Selecting Leave Unchanged will apply the last permission set that was in effect for this rep. If N/A displays, it indicates that they didn't have a permission set assigned to them previously. To assign a permission set for these reps, access the Reps tab after completing this screen. If applicable, select whether to allow this rep to register for events on the public website with their personal login but without logging into the Member Information Center. Selecting Leave Unchanged will apply the last setting that was in effect for this rep. If N/A displays, it indicates that they didn't have specific event permissions assigned to them previously. 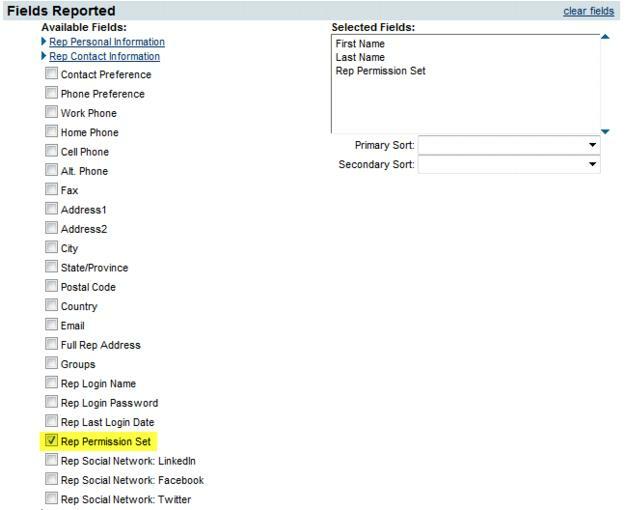 To assign specific event permissions for these reps, access the Reps tab after completing this screen. Upon re-activating, the Web tab->Redirect Index is reset to No Redirect Action, which will allow the member page URL to display instead of redirecting. See Redirect Index. In the event that you have duplicate members in your database (perhaps you had added a prospect, then the prospect applied on-line), you can easily merge two contacts together. Best Practice is to merge the older contact into the newer contact. NOTE: The user must have Administrative permissions to use merge feature. Select Members in the left-hand menu. Select the member that has the least information recorded. Click select member to open the Member Lookup screen. Choose the member to merge into and click Continue. For each row of information, click either the data in the 1st column (1st member) or the 2nd column (2nd member) to pick which data will end up in the final merged member. Selected data will appear in green. The first member recorded will be deleted and the 2nd member record will remain with the merged information. Note: Some data does not appear in the merge columns for selection. Some data is simply combined and will NOT display in the merge window: all billing information (fees, invoices, etc. ), communication, reps, event registrations, categories, keywords, locations, lodging info, change log entries, tracked benefits, and photos. Another reason data would not appear in the merge window would be if it already matches; no need to show it if it is the same in both records. The Community Member record provides a special way to organize information for a person that has some association with your association – but is not associated with a member. For example, a person who needs to be in a group that receives email, but isn’t a member would be a good example of a Community Member. Other examples include, but not limited to government officials, previous staff, or interested members of the community. Edit and add to the Community Members in your database by going to the very top of the member drop down list in the Members module. After you choose [Community Member], click the Reps tab. When on the [Community Member] record, the other tabs will not display any data; the only information displayed is on the Reps tab. Note: You can also find the [Community Member] by selecting Communication->View/Edit Community Member Reps.
Click Add a New Rep. Complete the Add a New Representative screen. Note: Make sure to fill-in the Company field if appropriate. To include a Community Member when creating groups or sending emails, make sure to remove the checkbox in front of the Show contacts for Active/Courtesy members only checkbox. Locate the member record and then select the appropriate information tab in the member’s record. Any changes you save to a member’s record are automatically updated throughout the database and within associated web site entries. Select the desired member in the Members module. Edit the Contact Information as desired. The Reps information will automatically be updated for address, phone and fax (when those same rep fields already match prior to the edit). Click the Reps tab and check the individual reps for any changes that should be made (if not already changed automatically). Click the Web tab to ensure that "Use Company Information" checkbox is selected (which means that the Web tab is already updated). If not selected, then you can update the Web tab with any desired contact changes. The join date is used for reference and in reports for the member. The Join is used to determine what month the new member is considered to have joined your association. On the General tab, edit the Join Date in the Additional Information area. Optionally, you may click the calendar icon to select a date. On the member's General tab, expand the Additional Information section. Select the desired Membership Type from the list. Membership status enables certain features and selections within the software and designates a distinction within reports and lists. Active – Member that receives all membership benefits. Active members are also categorized by their website package as either Enhanced or Basic. Courtesy: Member with same features as basic member but has a separate distinction in reports and lists; usually used to indicate a member given a courtesy (free, gratis) membership. Non-Member: Usually used to indicate a company that is not a member but may need to receive communication and be tracked within the database. Prospective: Member with same features as basic member but has a separate distinction in reports and lists; usually used to indicate a potential member that you are soliciting to become a member; may easily be upgraded to an active member. Dropped/Inactive: Was once a member but was dropped for some reason. Information is still available on this member through reports and lists; may be reinstated as an active member if desired. Note: If the Dropped/Inactive status is selected, a Drop Member Options window will display. See Drop a Member for more information. The Modified Date is a system date stamp that is not able to be edited. This date indicates the last time this record was modified in the system. It is displayed for reference and to be used in select reports. Items that will change the Modified date include adding/removing fees, updating contact information, modifying category assignments, webpage description and most all member record changes. Details of these changes are logged and may be viewed on the "Member Record Updates" report. Sales stages may be used for tracking your membership sales process. Sales stage is a reportable field, so you will be able to generate reports to view which members are at which stage. You may select an existing sales stage from the drop-down list in the Additional Information section of the member's general tab; or you may add/edit sales stages. On the General tab, click the edit stage options link Additional Information area. Click Add New Status Type. Related Organizations assist in tracking parent/child relationships between members in your database. For instance, a main bank location has multiple branch locations. The main location will be designated as the Parent and the branch locations will each be designated as a Child. This tracking is only for internal purposes and does not result in any changes to what is viewed in the public directory about these members or in the way that they are billed. This feature replaces the need for creating your own Custom Fields to track these relationships and also provides the added benefit of easy navigation and additional notes. NOTE: Available to those with Plus edition or greater. Click Add New Relation(s) to add a child or children to the current member. Add your own notes about that relationship. Are viewed on each member's record. Are included as fields on a custom report. Are included in the download from a custom report. Are used to filter the records in the Members module. Note: Additional custom fields may also be created to use on individual representatives, event registrations and within your groups. Boolean (True/False): Displays a check box that can be selected or cleared. Drop Down List: Displays your designated list of options that may be selected. On the member's General tab click Add/Edit Custom Fields in the Custom Fields area. Click the Data Type arrow. Click the desired data type. If the selected data type is Text, type the desired Text Size. If you have a large number of custom fields, you can add section headers to organize the fields, as shown below. Click the Add Section a Heading button. A new text field, labeled Section Header will be displayed. Replace the text (Section Header) with your header text. To arrange your custom fields within the sections you have added, click & drag the custom fields under the appropriate section header. On the member's General tab, click Add/Edit Custom Fields in the Custom Fields area. Click the check box at the end of the row of the Field Name that you wish to remove. NOTE: All data in the custom field will be deleted. Click in the text of the Field Name. Make the desired field name change. Click and drag the field to the desired location. Note: Most member database fields may be referenced in custom reports allowing detailed member information to be extracted. Completion of each field will give the most flexibility at a later date. How to send the "create account" email invitation to reps.
Click Members on the left side menu. Select the member you are adding a rep to from the Members dropdown list in the top tool bar. On the Reps tab, click Add a New Rep. Complete the form on the Contact Information section of the "Add a New Representative" screen. Note: Alternatively, you can add a new rep by selecting "Representative" from the Add button in the top tool bar. If the Rep name already exists on the same or a different member, a warning message will appear that displays the name of that member. You may continue on and create the rep if desired. Primary Contact: Selecting the Primary Contact checkbox will make this the primary contact representative for the member. Contact Preference: Select the preferred contact method for this rep. Email, Fax, Mail, Phone or No Communication. See How is the "Contact Preference" Field Used on the Reps Tab? Email: Note that the email address listed here by default is the email address provided on the General tab. This can be edited to contain rep's individual email if desired. Greeting: Specify the common name used by this individual. See also What is the Greeting field used for? Rep is currently active with this member When selected, this rep will be included whenever “active” reps are selected. This checkbox should be de-selected when the rep no longer is participating in membership. This checkbox may be manually de-selected here but may automatically de-selected when the member is dropped through selections made at that time. Billing Contact When selected this rep will be included whenever “Billing reps” are selected. Billing transactions typically are addressed to the “Billing rep”. See information on “Edit Billing Contact”. Comments Comments are viewed only by staff who access this page. This cannot be viewed by the member/rep. After creating a representative, you’ll want to invite them to create their login for the Member Information Center. Access the Login Permissions area on the Reps tab where you will have the option to send them an invitation. The best practice suggestion is to allow them to create their own by sending them the personal emailed invitation. Although if you are working with them at that moment, create their login right now with a temporary password that they can change later is an option as well. When Are Rep Logins and Passwords Created? When reps respond to the mass email that you send which invites them to create their login account. Using the pre-defined email template “Create Login Account Invitation” (or one created by you), your representatives will be able to create their own login account and immediately access the Member Information Center. This should be done when you first get your database and are ready for members to start logging in. It can also be done at any time that you desire to encourage more reps to create their personal account. Any rep may have a login and password created they are added to the Reps tab. You may create a login for them right there or there is a link to send them an invitation (recommended). Members that have Read/Write permissions to Employees/Reps have the ability to add a new representative to their membership list. At the completion of creating a rep, there is an opportunity to send an email invitation to this rep so they can create their own login account. It is best practice to assign a unique login and password to each individual rep that they will use when accessing the Member Information Center. Once logged in, they will have ability to view and perform specific functions based on the permissions that are assigned to them. Read more about permissions. You may create the log-in credentials for them, or you may send them an invitation with instructions to create their own credentials. On the member's Reps tab, click the name of the rep for which you wish to create credentials. Click Create their login right now. The Create your Account screen will be displayed. Enter a Login Name. The rep's email address is populated by default, you may change this as needed. Login names maximum 60 characters. The login name may include alpha-numeric and common keyboard symbols. Login name is NOT case sensitive. Enter a Password. Password maximum: 20 characters. The password may contain alpha-numeric and common keyboard symbols. Password is NOT case sensitive. Click Continue. The account is successfully created, and you can email login credentials to the rep.
Click send them an invitation. The email editor will open, with the Member Area Access email template. The template includes instructions for the rep to setup credentials. You may use the template as is or, edit as needed. Make any desired edits, and click Send Now. Watch a video on how to send the "create account" email invitation. A mass email may be sent to your representatives inviting them to create a login and access the Member Information Center. Ensure that all representatives are marked with the proper role assignment. Look at the selection of Primary and Billing on the Members -> Reps tab in the Personal Information area for this role assignment. Hint: Run a custom representative report that includes the fields “Is Primary Contact” or “Is Billing Contact” to ensure you’ve assigned the desired role for each rep. Default permissions are assigned according to this role but may be changed or overridden later if desired. Select Communication in the left-hand menu. Hint: Select representative email addresses using the choices under Add Representatives. If sending to a member email (choices under Add Members), the primary rep will be invited. Although this works, your member may be asked for more verification information. Click Edit with ChamberMaster / GrowthZone. 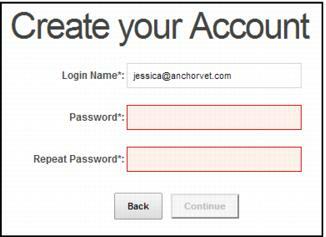 Select the predefined template called “Create Login Account Invitation”. Add your own subject line and make desired changes if desired. No changes are necessary though – only if you desire. The personalized link in the email is what will allow them to create their login with appropriate permissions. Note: you may also create your own email and simply embed the personalize account creation link using the mail merge field title “Create Account Link”. Find this field by clicking Add Database Field, open the Rep Contact Information section, and select Create Account Link. This will populate with the specific registration link needed for each rep that receives the email. See this video starting at 4:20. When the email is received and the personalized link is selected, the rep will be brought to a screen where they may create their own login and password. Their email address will be suggested as the Login Name. Or if not available, then another suggestion will be provided. They will be allowed immediate access to the Member Information Center. If an account has already been created, the notification below will be displayed. They will be redirected to the login page or to the page where they can request a reminder. Scroll to the bottom of the screen. Open the section titled “Login Permissions for...”. Look to see if there is a Login Name listed. If not you can send an invite to your rep so they can create their own login. NOTE: Customers that joined us before the winter of 2011 will only have a single member login enabled (one login per member found on Members->Web tab) unless rep logins have been assigned/created since then. Without rep logins, control of what is seen in the Member Center happens member by member – not rep by rep. Permission assignments allow you to limit the access the reps will have to the Member Information Center (MIC). 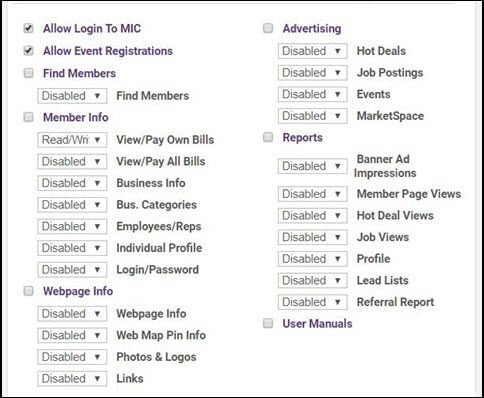 Permissions exist to allow members to pay bills, change their company profile, post deals or jobs, view reports, modify their own information, and other. These permissions are grouped together in permission sets. Permission sets are a named group of individual rights that are granted to a rep.
Four permission sets are created by default but others may be created as needed. Click a section below to learn more. Using the automatic inherited rights assignment that is based on the role assignment of Primary, Billing, or Standard may be all you need. Four permission sets are available by default but others may be created as needed: These permission sets may also be modified to fit your specific needs but they may not be deleted. Primary permissions give all rights to everything in the Member Information Center. They also have rights to modify and create additional reps.
Standard permissions only allow registration for events and to change their own login credentials. View only rights are available to the rest of the information. No rights are given to view reports. Finance permissions includes same rights as Standard permissions but additional rights to pay bills, access to the Business Information and to view reports. Prospect permissions include rights to change login/password but view only rights to their webpage and member information. This permission set is automatically applied to all reps that belong to a member with Prospective membership status. NOTE: One additional set may appear in your list of permission sets. *MembertoRepTransition permissions set was created by the system during a short time period during September 2013. The set was created automatically when a member logged in with a Member Login and then was asked to create a Rep login with a goal of transitioning your members to a representative login. It applied only to those with Member Information Center v3 enabled at that time. This automatic creation has since been disabled and the process replaced with changes that occurred in the February 2014 software release. If you have any reps assigned to this set, feel free to leave them in that set if all is working correctly, or rename the set to something more meaningful to you or assign the reps to other sets that meet your needs better. For many users, the automatic inherited rights will be all that is ever needed to manage the permissions needed for your members to access the Member Information Center. Inherited permissions will be granted by default based on the role assignment check-marks in the Personal Information section on the member's Reps tab. A rep marked as Primary Contact will automatically be given the Primary permission set. A rep marked as Billing Contact will automatically be given the Billing permission set. If the default permission sets of Primary, Billing and Standard are not sufficient, any rep may be assigned a custom permission set. 1. Create and assign a custom permission set. 2. Once a custom set is assigned, your override will be maintained. Changes to the role assignment checkbox will no longer change the permission to the inherited permission set. 3. If automatic inheritance is desired instead of the custom permission set, change the permission set back to the default set that should be inherited. This rep will resume the automatic inheritance. Note: If you have Custom Set assigned to your reps and you are not sure why, watch this video – starting at 2:51 to hear an explanation of how to manage these sets that were imported after 2/21/2014 due to rep permission changes that happened. Reps may be limited in what they can access in the Member information Center by using permission assignments. These individual permissions are then grouped together and saved as a permission set and then assigned to a rep. Tip: Take advantage of the default permission sets that are already created. You may find that these already have your desired permissions selected or that minor tweaking will make them work great for your needs. These default sets in combination with automatic inheritance of these permissions will make handling permissions very simple. However, custom options are available if needed. The MIC permissions displayed are controlled by the global Member Login Area Options & Settings . Click here for more instruction on setting the available MIC permissions. The checkbox must be selected in order to allow any permissions in this section. Removing the checkmark from Member Info would remove all access to the areas in that section. For example, "Member Info" must be selected to allow any permissions in this section. Click Here to view a list and description of the permissions options. Note: The permissions available here are controlled under Setup-> Member Login Area Options and Settings. Click Manage Permission Sets in the Member Options area. Type the name of the new permission set in the Permission Set Name: field. Select desired permissions. Note: If individual items are enabled, make sure to also select the checkbox for the heading of that section. When deleting a custom permission set, the rights assigned to a rep will be reverted back to their inherited permissions. Click the x at the end of the row of the desired permission set to be deleted. The permission set is now deleted. 1. Click Members in the left-hand menu. 2. Select the desired member and click the Reps tab. 3. Select the desired rep.
4. Scroll to the bottom of the screen and open the “Login Permissions for …” area. 5. Click View and Manage Permissions. 7. Make desired changes to the set or create and assign a new set to this individual. A list of the assigned permissions sets is available when running the custom rep report. 1. Click Reports in the left-hand menu. 3. Click the green arrow in the Reports window to the right of the Custom Representative Report. 4. Click the category where the desired field is located in the list of Available Fields. 5. Click the check box in front of the desired fields, making sure to include the Rep Permission Set field under the Rep Contact Information category. 6. Continue following standard instructions for creating a custom report. 7. The report will display the assigned permission set. On the Reps tab, click the desired rep’s name in the List of Representatives area. The selected row will show in yellow. Edit the fields in the Personal Information area. Note: You can click copy business information to copy all contact information from the General tab to this rep. All fields are copied which include the phone numbers and email address. You may add bio information for a rep either from the database, or the rep may update their own information in the MIC. Personal Bios will only be displayed if the rep is in a group which displays publicly, not member web pages in the directory. 1000 characters max. Click here for more information on how to set up display of bio information for groups. NOTE: When creating a Personal biography, if the 1000 character limit has been reached, a message will appear indicating the total you've reached (which includes HTML markup) so you can reduce your amount by that many. This occurs for either staff in the back office or members in the Member Information Center. Inactive status is reserved for a rep who is no longer acting as a representative for the member. The rep’s information and history will be retained but there is a separate distinction given to them in reports and lists. Removing a rep should be limited to a rep that was created by mistake. History and all reference to this rep would be removed. For the desired member, click the Reps tab. In the Lists of Representatives tick the check-box for the rep you wish to in-activate/remove. Click the Remove/Inactivate Reps link. Set rep as inactive and leave in current groups: This option will set the rep as inactive (and deactivate MIC log-in credentials), but leave the rep in any groups he/she is participating in. Set rep as inactive and remove from groups: This option will set the rep as inactive (and deactivate MIC log-in credentials), and remove from any groups he/she is participating in. This will remove from ALL groups. Set rep as inactive and inactivate in groups: This option will set the rep as inactive (and deactivate MIC log-in credentials), and deactivate in any groups he/she is participating in. When deactivated in a group, the ep would not receive email notifications sent to the group. This will deactivate in ALL groups. 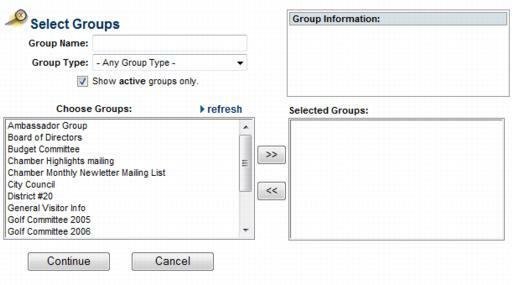 If you wish the rep to remain active in certain groups, select this option, then reactivate in the individual groups. Delete rep records and remove from groups: This option will permanently delete the representative. This is not recommended practice, as historical information is maintained about reps in the database, and all will be deleted. If deleted, and you wish to restore, GrowthZone can do so, but fees will be applied. The rep may need to be reassigned to groups if the rep was originally removed from groups when inactivated. 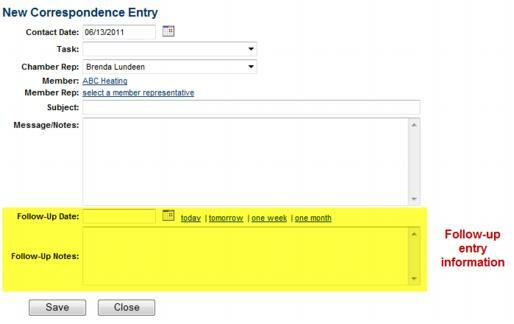 On the Reps tab, click the check box in front of the desired rep’s name in the List of Representatives area. Click to the Rep is currently active with this member check box in the Personal Information area. Note: Representative History will keep track of the members that this rep has been assigned. To view the history, locate the rep under Members->Reps tab. Open the Personal Information area and click History which is located after the “Rep is currently active with this member” checkbox. Once a rep is in the database, they may be reassigned to another member instead of deleting and then recreating the rep as this would eliminate any history and group associations. Click Assign to a different member or Assign to no member Community Member. See Community Member for more information. If Assign to no member Community Member was selected, the task is complete. If Assign to a different member was selected, click the desired member in the Member Look-up screen. Note: Representative History will keep track of the members that this rep has been assigned. To view the history, locate the rep under the Members & Reps tab. Open the Personal Information area and click History which is located after the “Rep is currently active with this member” checkbox. Custom Fields are designed to give ultimate flexibility in managing your data. 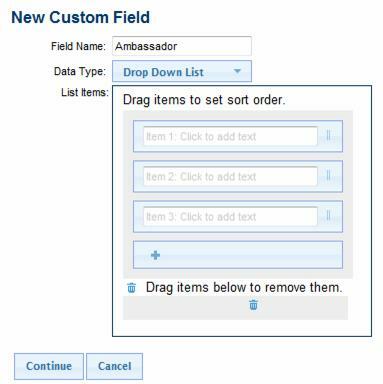 When adding a custom field, you will create a database field that is available across all member records for tracking additional desired information. On the member's Reps tab click Add/Edit Custom Fields in the Custom Fields area. On the member's Reps tab', click Add/Edit Custom Fields in the Custom Fields area. On the member's Reps tab, click Add/Edit Custom Fields in the Custom Fields area. Send Email is an option located multiple places throughout the software. The Send Email button on the Reps tab is used to generate a quick email to a particular representative(s). On the Reps tab, click the desired rep’s name in the List of Representatives. The selected row will show in yellow. Or click the checkbox in front of the desired representative name. 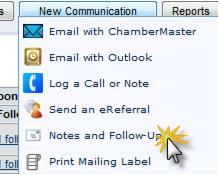 Hover over Send email and select Email with ChamberMaster / GrowthZone or Email with Outlook. See Email Sending Options for more information. If selecting Email with ChamberMaster / GrowthZone, complete the Send an email screen OR if selecting Email with Outlook, complete your own email screen and send using your own familiar steps. On the member's Reps tab, click to select the check mark in front of the desired reps to be emailed in the List of Representatives area. 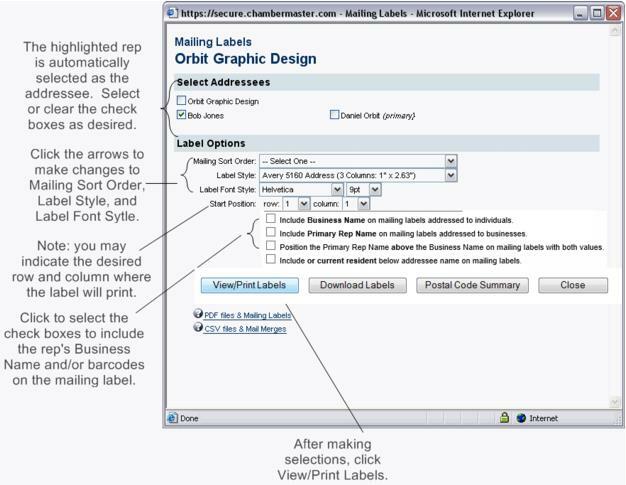 Printing labels is a function you can do in multiple places throughout the software. The Print Labels button on the Reps tab is used to generate a quick label to a particular representative. On the member's Reps tab, click the desired rep’s name in the "List of Representatives" area. The selected row will show in yellow. 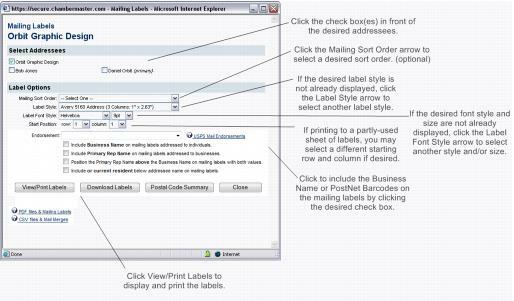 Complete the Mailing Labels screen. From the File menu, click Print. Make desired selections and click OK. Note: The label data may be downloaded to a comma separated value file by selecting "Download Labels". The Display Preferences for a rep determine what other members see about this rep in the Member Information Center (MIC) or what should the public see about them in the public directory listing. Select the display preferences for this representative. The Display Preferences can be configured in the database, and/or the rep may view and modify the selections in the MIC under Personal Information. The members' ability to set these selections depend on the Permission setting titled Individual Profile. In the Display Preferences section, select what information to display publicly, and what information to display in the MIC. NOTE: Defaults for these setting can be specified under Setup > Define Default Rep Preferences in the Member Options section. Member representatives may be grouped together to assist office staff in working with these reps as one entity. For instance, a task force designed to work with technology may belong to a group named Technology Task Force. When a mailing goes out to these individuals, you may select the Technology Task Force group and generate mailing labels specifically for these members. These groups are created in the Groupsmodule. Once created, reps may be assigned to these groups either in the Groups module or in the Members module on the Reps. tab. Click Here for further information on creating groups. On the member's Repstab, click the desired rep’s name in the List of Representatives area. The selected row will show in yellow. Click Join a Group in the Group Participation area. Click the desired group name in the Choose Groups list. Click the top double-headed arrow to move the desired group to the Selected Groups list. On the member's Reps tab, click the desired rep’s name in the List of Representatives area. The selected row will show in yellow. Click to select the check box in front of the Group Name that you wish to remove. Click Remove Rep from Selected Groups. Click the name of the group that you wish to disable for this rep.
Click to select the >Disable in this groupcheckbox. Note: Disabled reps will not display by default when viewing the Group roster in the Groups module. Click Show Disabled Group Members. Staff may “impersonate” a representative in order to see what the rep would see in the Member Information Center and perform tasks on their behalf. Click the desired rep in the list of Representatives. If the representative has a login and password assigned to them and “Allow login to MIC” is selected as a permission in their assigned permission set, then a [Login] link will appear after the representatives’ name. Click the Login link next to the representative’s name. The Member Information Center (MIC) will open in a new browser window where you can function as if you were that representative. This will allow you to change settings, pay bills, or view things as they would see them. A reminder of your impersonation is displayed at the top of this screen. When finished, close that browser window instead of choosing the Member Info Center Logout choice. This way you will remain logged in as the staff person in the original browser window. On the Account tab, click select a billing rep in the General Information area. NOTE: This options is only available when a billing rep has not previously be selected. On the member's Account tab, click Change Billing Rep in the General Information area. Click the desired rep name in the Choose a representative list box. On the Account tab, click remove billing rep in the General Information area. The Billing rep and their billing contact preference may also be selected/changed by the member in the Member Information Center if they have the proper permissions. The address of the Billing rep is the address that invoices are sent to by default. Integrated billing: If a Billing rep is changed to a different person or a different address after an invoice has been created, the old invoice will not automatically be updated with the new address. To update the old invoice to the name/address of the new Billing rep, click into the invoice, click edit in the "Bill To:" box, and click "choose rep" and select the appropriate new name. Renewal month is the month that the member begins their membership term with you. It is also used when selecting which members should be included in the invoice batch – select members by renewal month. Note: Each fee item may also have a designated Renewal Month making it so you can invoice the membership fee on a particular month and other recurring fees on another month. This field is only setting the default value for their account. On the member's Account tab, click the Renewal Month arrow to drop-down arrow. Fees/dues assigned to the member can be set as recurring regularly or added as something to invoice only one time. Once they have been assigned to their account, they can be invoiced under Billing->Invoices (Integrated Billing) or under QuickBooks->Recurring Invoices. NOTE: The Next Billed column in the Membership Fees and Dues area reflects the name of the monthly batch that this fee/due will be included in or already has been included in. This column will automatically display the next billing month when the current date passes that month. For instance, if the current date is February 2017 and a fee/due is set to be billed in February 2017, the Next Billed column will display February 2017 until March 1, 2017; then it will automatically switch and display February 2018. To see if a particular fee/due has been billed, refer to the transactions displayed in the Transaction History area. On the Account tab, click Assign Fee Items in the Membership Dues and Fees area. In the Fee item list, select the appropriate fee or due. Enter a Description of the fee item. Accept or over-write the default Fee Amount. The default value is the fee amount associated to the item when it was first created. Quantity - enter the quantity of this fee item. Select the Billing Cycle. The cycle selected will drive the frequency at which the fee item will be billed. For example, if the fee item is $1200 and you select monthly, $100 per month will be the monthly recurring fee item. Select the renewal month from the every drop-down list. Select the Status of this fee item. See below for information on setting up a fee In Date Range. Select the contact to whom the invoice for this fee item should be sent from the Bill To: drop-down list. Charge to ACH, debit or credit card: Click the radio button if you wish to automatically charge this fee item to a credit card, or to a bank account. Click here for further information on setting up e-payments. To make sure this fee item is included in the recurring invoice batch, set the Billing Cycle to a frequency of Annual, Semi-Annual, Quarterly, or Monthly. In the Standard edition or below, fee item frequency starts on the Renewal Month specified on the Members account and does not have an option within each fee assignment for a different month. If the Status on a Fee Item is set to Active in Date Range, (only available with Plus edition or greater) an option is available to place a start date and expiration on a fee item. Charge to ACH, debit or credit card selection displays options for setting the fee to be automatically billed. On the Account tab, click to select the check box in front of the fee/due that you wish to remove. Click Remove Selected Fee Items. On the Account tab, click the name of the fee/due that you wish to edit. Note: Fees can be modified for all users globally under Setup->Fee Items List (Integrated Billing) or under QuickBooks->Fee Items tab. While creating or modifying a Fee Item assignment on a Member’s account, a Status of Active in Date Range may be specified. This will allow a start date and expiration date to be assigned to this particular Fee Item. You can allow your members to save their payment information for re-use and you can setup their dues billing to use that saved information as well. With stored payments enabled, members who are paying online for membership or simply an event registration will have the option to save their credit card information. The next time they need to make a payment they can select a saved card and that will save them the time spent entering that information. All credit card information is stored within Authorize.Net's Customer Information Manager (CIM) which provides a secure method of storing credit/debit card or bank account information. As an added benefit with saved cards/bank accounts enabled your staff can setup a member's account to automatically bill their saved card for their membership dues. Must use Authorize.net or Integrated Payment Processing (Stripe) as your payment processor. Need to have the Customer Information Manager enabled on your Authorize.net Account. See instructions for setting this up here. Must have a plus edition or higher version database. Setup your Authorize.net account to allow for saved card and bank account information. Setup and assign the recurring fee amounts on your customer accounts, which includes assigning the fee and adding an epayment profile. *Requires Integrated Billing; Authorize.NET AIM integration; CIM enabled at Authorize.NET for credit/debit card management; and eCheck enabled at Authorize.NET for ACH bank drafts. Note: Authorize.NET gateway emulators are not supported at this time. Note to legacy ‘ACH’ users: In order to integrate the recurring automatic ACH selection with the option that we've called "ACH" for many years, we renamed the old "ACH" selections to "Manual epayment" (Oct 2014). It still works the way it used to but now the new automated selections are integrated into these same choices. The Current Balance displays the sum of all invoices and payments recorded. Balances displayed in red indicate an amount owed. Balances displayed in black indicate payments that meet or exceed current invoice totals. Voluntary fees, if any exist, will not be included in the Current Balance but will display separately next to the balance amount, as shown above. (QuickBooks CQI only) Balances will display the word UNKNOWN when using with QuickBooks CQI. An update of the balance has not taken place yet. Click Refresh QuickBooks data to update the account balance for this member. The connection to QuickBooks must be functioning properly for the balance to refresh. On the Account tab, ensure that the one-time fee has been added in the Membership Fees and Dues area. If not, click Assign Fee Items and add the one-time fee. Click invoice now in the Frequency column for the desired one-time fee. Edit the Invoice Options fields or make desired changes to invoice fields. CQI Users Only: Ensure that the check box(es) in front of the desired invoice items are selected. You may click to select any or all one-time fees to be included on this invoice. Click Create Invoice Now (CQI) or click Save (Integrated Billing). The invoice is automatically created at this time. 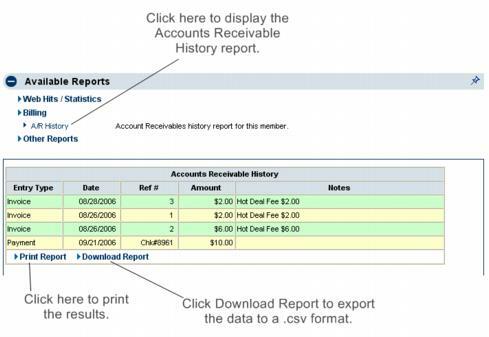 Note: If connected via the CQI, the QuickBooks connection must be active in order to complete this transaction. Invoice Activity (QuickBooks integration only) Invoice Activity displays all invoices for this member by reading QuickBooks data (QuickBooks integration only). Invoices are not generated here but the list can be sorted, printed, or downloaded. With QuickBooks Integration you may need to click Refresh QuickBooks Data in order to view the current list of invoices. Figure 5-18 Invoice Activity (QuickBooks integration only) Sort the invoice list 1. On the Account tab, click the heading of the desired column in the Invoice Activity area. The screen will refresh and be sorted in ascending order according to the selected column. With QuickBooks integration, you may wish to update the invoice list by selecting Refresh All Invoices/Payments at the bottom of the screen or by clicking Refresh QuickBooks Data at the top of the screen. Print the invoice list 1. On the Account tab, click Print Invoice List in the Invoice Activity area. 2. The desired output will display on the screen. On the File menu, click Print or click Print at the bottom of the screen. 3. Click to select the desired printer and click Print. 4. Click Close. Download the invoice list 1. On the Account tab, click Download Invoice List in the Invoice Activity area. 2. Follow the prompts on your screen to either open or save the Comma Separated Value (.csv) file. If the data is displayed immediately, you may wish to select Save from the File menu to ensure this data is available for viewing at a later time. Payment Activity (QuickBooks Integration only) With QuickBooks Integration you may need to click Refresh QuickBooks Data in order to view the current list of payments. If the member has never been created in QuickBooks, member synchronization must happen first. See Chapter 5, “Manage Account Information” - - General Information, Synchronization for more information. Payment Activity displays all payments for this member by reading QuickBooks data (QuickBooks integration only) or from the integrated billing program. Payments are not entered here but the list can be sorted, printed, or downloaded. With QuickBooks integration, you may wish to update the payment list by selecting Refresh All Invoices/Payments at the bottom of the screen or by clicking Refresh QuickBooks Data at the top of the screen. On the Account tab, click the heading of the desired column in the Payment Activity area. The screen will refresh and be sorted in ascending order according to the selected column. On the Account tab, click Print Payment List in the Payment Activity area. The desired output will display on the screen. On the File menu, click Print or click Print at the bottom of the screen. Click to select the desired printer and click Print. On the Account tab, click Download Payment List in the Payment Activity area. Follow the prompts on your screen to either open or save the Comma Separated Value (.csv) file. If the data is displayed immediately, you may wish to select Save from the File menu to ensure this data is available for viewing at a later time. 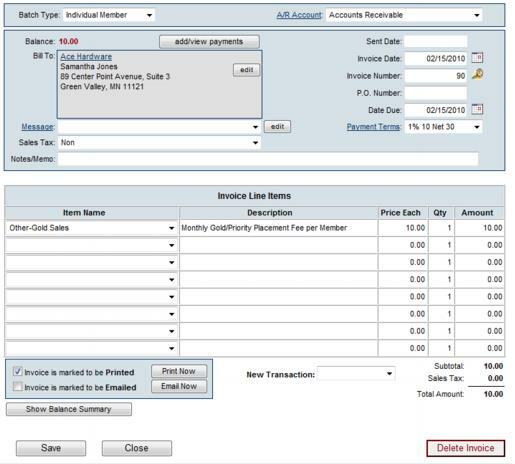 Transaction History displays all invoices, payments, credits, and sales receipts from integrated Billing. New invoices, sales receipts, payments, and credits may be created here by those with Finance or Administrator permission. 1. On the Account tab, click the heading of the desired column in the Transaction History area. The screen will refresh and be sorted in ascending order according to the selected column. Click the column title again to sort in descending order. 1. On the Account tab, click the arrow in the View dropdown list. Select the desired view selection. 2. Click more… to view transaction from a different date range. Information and settings related to the member’s online directory listing is modified on the Web tab. Changes made here are automatically reflected in the online directory. The member may also modify these items in the Member Information Center (with proper permissions). If the Web Contact Information is dimmed, the company information is being pulled from the General tab and cannot be changed here. Make editing changes on the General tab in the Contact Information area. If the Member Information page in the Business Directory should display different information than the Contact Information on the General tab, click to clear the Use Company Information check box. On the Web tab, edit the fields in the Company Information area. Social Network Services with a check-mark will be displayed on the Member Information Page. NOTE: The available social networks may be configured under Setup > General Options & Settings. There are three levels of participation in the online directory: Non-member, Basic Package, and Enhanced Package. The level chosen determines what selections will be available in the Web Participation Options area, the Web Description / Text Content area, and the Web Photos & Images area on the Web tab. The default level is the Basic Package but may be upgraded to Enhanced Package or downgraded to the Non-Member selection. Non-Member: Non-members may have their business name, address, and phone number displayed in the online directory search results but their business name cannot be hyperlinked to their Member Information page. Only three Display Attributes are available for Non-Members: Does not Display on Web , Hide Social Networks and Web Link on Search Results. Check the Does Not Display on Web check box if this member should not display in the online directory search results. Check the Web Link on Search Results check box if this member should have a Visit our website link in the search results. Web Description/Text Content may be completed but will not be displayed on the web site. The Non-Member Web Participation package is not automatically selected when Non-Member Membership Status is selected on the General tab. These selections are made independently. Basic Package: Members belonging to the Basic Package may have their member name, address, and phone number displayed in the online directory search results and may choose to have their business name hyperlinked to their Member Information page. All Display Attributes are available to members in the Basic Package. The Web Description / Text Context area includes the following fields: Description, Hours of Operation, Driving Directions, and 240 characters for Keywords. Web Photos and Images are not available. Enhanced Package: Members belonging to the Enhanced Package may have their member name, address, and phone number displayed in the online directory search results and may choose to have their member name hyperlinked to their Member Information page. All Display Attributes are available to members in the Enhanced Package. The Web Description / Text Content area includes the following fields: Description, Results Summary, Hours of Operation, Driving Directions, Additional Bulleted Description, and unlimited characters for Keywords. All Web Photos & Images selections are available which include a search results icon, logo image, a photo gallery, video, and a map image selection. This option is available if you have purchased the Pro or Premier edition, or the Marketing Add-on package. Note: The Enhanced Package is only available in the Pro or Premier Package, or to those who have purchased the Marketing Package add-on. Refer to http://www.chambermaster.com/pricingFeatures] for updated products and pricing. .
On the Web tab, click the Web Participation arrow in the Web Participation Options area. Display Attributes determine the display options in the online directory and settings in the Member Information Center area. Display Attributes. On the Web tab, select the check box in front of the desired attribute. Web Link on Search Results: Member will have a Visit our website link displayed in the online directory search results. NOTE: When Web Participation is set to Non-Member, only three Display Attributes are available: Does Not Display on Web, Hide Social Networks and Web Link on Search Results. This function allows you to generate a URL to open this members information page directly. On the member's Web tab, click Generate a URL to open this member’s informational page directly in the Web Participation Options section. Triple-click the generated link text to select it. Right-click the highlighted selection and select Copy. Click in the desired location, right-click and select Paste. The Redirect Index is automatically set to 307-Temporary Redirect to Business Directory when a member is changed to Dropped status. This selection may then be changed to any other selection as desired while the member is in dropped status. This is particularly useful so that dropped members do not continue to promote their Member Information Page as a website for their customers. On the member's Web tab, open the Web Participation area. Select the desired Redirect Index from the drop-down. Note: Members may also modify this web display information in the Member Information Center. On the Web tab, edit the fields in the Web Description/Text Context area. NOTE: For members who have been assigned an Enhanced Package, images and videos may be added. Basic Package does not include this feature. The GrowthZone Marketing package is required to have the enhanced option. On the Web tab, click Add Image in the Action column of the Image Type that you wish to add in the Web Photos & Images area. Note: Enhanced members may add photos and images. Non-member and Basic package participants do not have this feature. Type the path and file name of the desired graphic file or click Browse to locate and click Open when desired graphic is located. On the Web tab, click Enable in the Action column of the Search Results Icon in the Web Photos & Images area. Note: Search Results logo will only display if enabled for your members under Setup > Member Login Area Options and Settings. Make sure Search Results Icon is set to Enabled under Menu Items & Permissions. On the Web tab, click Remove Image in the Action column of the Image Type that you wish to remove in the Web Photos & Images area. On the Web tab, click Change Image in the Action column of the Image Type that you wish to change in the Web Photos & Images area. On the Web tab, click Disable in the Action column of the Search Results Icon image type. Note: if an image was already uploaded for this Search Results Icon image Type, it will not be removed, only disabled. On the member's Web tab, click Uploaded Image in the Web Photos & Images section. Google Maps are integrated into the online directory and will automatically display a map pin at the location of your identified address. This location, the description on the map pin, and whether the pin even displays may be modified. On the member's Web tab, click Google Maps in the Web Photos & Images section. Click the Show on Business Directory radio button in the Search Results Map Information section. Choose Physical Address from General Tab to use the address entered on the general tab, or select Custom from the drop-down list to enter an address. The map will populate the location based on the address you have entered. If needed, drag the marker to refine your position on the map. On the member's Web tab, click Manually Set Coordinates. Enter appropriate GPS coordinates or manually drag the map pin to the desired location. Click the Look Up hyper-link to look up coordinates. If using MyChamberApp, members can select an appropriate point of interest categories for their business. This will determine the category where they will display and override the assignment given to their QuickLink or Business Category. See Point of Interest Categories. Select the desired Point of Interest Sub-Category. On the Communication tab of the desired member, click New Communication. Click Log a Call or Note. Date of Call - Type the date that the communication occurred. The current date automatically displays but can be edited. Optionally, you may click the calendar icon and select the desired date. Member Rep - Select the name of the member representative that communication was with. Clicking not in list will allow you to add another member representative to the database. Association Rep - Select the staff person who communicated with the member. If the staff person is not in the list, they may be added by selecting Chamber Employees/Reps from the Setup menu prior to selecting Log a Call. Task - Select a task item that indicates the nature of this communication. New task items can be created by selecting Add a New Task Type in the edit task options. These task items are then available as a Task item across all member records. The ability to add new task items is only available to staff with Administrator level permissions. Notes - Enter notes for this communication. Note: Communication history for all members may be searched by selecting Member Contact Report from the Communication menu. Sending an email may be done multiple places throughout the software, any of which will automatically create an entry in the communication history. However, if sending to a single member, choosing Send an Email on the Communication tab streamlines the process by automatically selecting the current member’s email address. On the member's Communication tab, click New Communication. Click Email with GrowthZone/ChamberMaster or Email with Outlook. 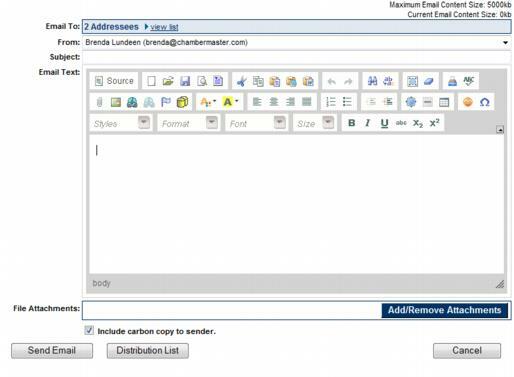 Email with GrowthZone/ChamberMaster, edit the desired Send an Email fields. See Figure 4-3 and Table 4-2. If selecting Email with Outlook complete your own email screen and send using your own familiar steps. See Email Sending Options</span>” for more information. NOTE: Selecting to include a carbon copy to sender allows a staff person the ability to store and file emails in their own email program and also the ability to view the email as it will be seen by the recipient. From: Select the email address for the one who should be displayed as the sender. Names and email addresses displayed here are pulled from the current list of staff names. Edit the names and email addresses displayed under Employees/ Reps in the Setup menu to change the email addresses displayed here. The email address of the logged-in staff person is the default address displayed. Email Text: Type your email message here. Use standard formatting selections to customize your message. Attachments: To add an attachment click Add/Remove Attachments and follow the directions on the screen. Include carbon copy to sender: Click to select the Include carbon copy to sender check box to receive a copy of this message at the From address listed above. Task: Select a task item that indicates the nature of this communication. If the desired task item is not listed, create your own under Setup->Correspondence Categories. These task items are then available as a Task item across all member records. The ability to add new task items is only available to staff with Administrator level permissions. You can create and print letters and fax output using the selection Form Letters under the Communication module. See Creating a Letter and Create and Send Fax Output. The eReferral is designed to accomplish two tasks with a single entry - getting desired member information to a consumer while letting the member know that they’ve been referred. 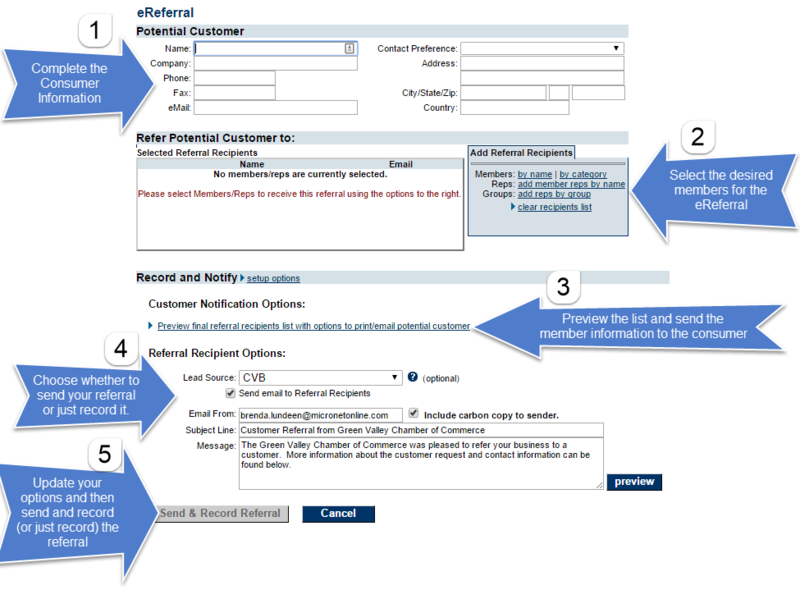 Pertinent consumer information is entered and then the eReferral tool is used to generate an email message or printout that includes the selected member(s) contact information in referral format. You can then choose to pass along the consumer's information to the members you referred. Through a separate optional email message, your member(s) are informed that their business information was passed on to an interested consumer. In turn the consumer's information is provided to your members so they can, if they so choose, provide additional outreach to that consumer. eReferrals allow you to show give your members' information to consumers when they ask for it. At the same time you can choose to send that consumer's information to your members giving them a lead. Every eReferral is recorded allowing you to show your members the value that you are giving them. Each referral means you are pointing customers to their business. Take for example, a consumer that calls and asks for a list of restaurants in your area. You enter their contact information in the eReferral screen. After selecting the Restaurant category members as your designated recipients, you click one button to email the detailed restaurant list with addresses, phone numbers, and web site address to the consumer. Then you click one additional button to send an email to the restaurant members with a message indicating that they have been referred. All these steps are handled under one screen. If you don't want to send an email to your members that's no problem. You can still record that you referred a member to them so they can see or be shown the added benefit of their membership with your association. Click the Add button at the top of your database. Enter in as much or as little Potential Customer information as desired. Select the members you wish to refer. You can select members by name or category. You can also select specific representatives by name or by group. When selecting members by name or category you can expand the advanced filter section and filter by boolean type (checkbox) member custom fields. Review the information and at the bottom you can print or email this list to the potential customer. Checked will send an email using the options below to those being referred and will record it in the member's communication history. Unchecked will just record the eReferral in the member's communication history and will not send an email to your members. Adjust your Email From, Include Carbon Copy, Subject Line and modify your Message with details about the potential customer if desired. Click Setup on the main left menu. Customize the default subject and message for the email being sent to your members. Customize the default subject and message for the email being sent to the consumer. If you are using multiple lead sources edit your list of lead sources. The first item in the list will be the default lead source. Lead source list can be blank. This is an optional field. Follow-up reminders may be specified for any communication history item which will display as a Reminder in the Task List on the designated date. Follow-Ups may be designated for another staff member to complete by selecting the desired Rep on the Follow-Up entry. Find the desired communication that requires a follow-up on the members’ Communication tab. 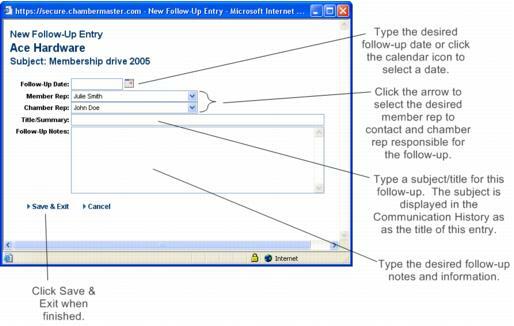 If no follow-up entries currently exist, click add follow-up in the Follow-up column on the Communication tab. If follow-ups entries already exist for an item, click the title of the desired event, then click Add a New Follow-up Entry. Complete the New Follow-Up Entry screen fields. On the Communication tab, click Notes and Follow-Up from the New Communication drop-down menu. Complete the New Correspondence Entry window. Click the check box(es) in front of the desired Addressees. Complete the rest of the Mailing Labels screen. Click View/Print Labels. The desired output will display on the screen. Select the desired printer and click Print. The member's Statstab gives staff the ability to view and print the member’s event activity, web site hit statistics, the member’s Hot Deal hit statistics, and reports showing the member’s accounts receivable billing history, and a profile of the member’s account. As the Guest List in the Events module is updated to include registered member representatives, the Event Activity list on the member's Stats tab will automatically reflect their attendance. Only those with a status of Registered will appear in the Event Activity list. If their name shows in the Actual Attendees column, that means that they were checked off as actually attended under Events-Guest List- view/edit attendance list or checked off as attended using the app for staff. You can print or download the event activity report. The member's Stats tab allows staff to pull all accounts receivable history on to one screen for viewing, printing, and exporting. If using QuickBooks integration, the CQI service must be available in order to generate this report. This information is also available under the members' Account tab in the Transaction History area (or Invoice and Payments area if using the CQI connection). On the member's Statstab, click Billing (if not already open). You can print or download the invoice list. The Member Profile report will allow staff to view and print information associated with a member’s account. The report will vary in size depending on the selections made. On the Stats tab, click Other Reports (if not already open). If the Other Reports is already open, clicking it will close the selection. Click to select the desired check box(es). Click View/Print Report. You may view the report or also print the report by selecting Print from your browser software. Make desired selections and click OK. The Member Benefit Report is a printable listing of membership benefits used by member. On the member's Stats tab, click Other Reports (if not already open). If the Other Reports is already open, clicking it will close the selection. Click Print Report if desired. Best Practice: Use the member benefit report as a way to let your members know how they are taking advantage of their membership, and benefiting. You may wish to use the mass email functionality afforded by the Member Benefit Batch Print or Email report to reach out to multiple members based on their renewal dates. Click Here for further information on mass emailing the Member Benefit report. I’m "missing" members in my drop-down list. Where did they go? “This page is not available for the [Community Member] record." What does that mean? How do I drop or inactivate a Member? Will the software warn me if I try to create a duplicate member? Does updating the member contact info automatically update my representative contact info? What does the pushpin do? If someone is listed as a contact under multiple memberships is there a way to set them up so that they only need one set of login credentials? “This page is not available for the [Community Member] record. What does that mean? How is the Contact Preference field used on the Reps tab? What is the Greeting field used for? Can I view history for each rep? How do I specify who my featured members are? Who can login to the Member Information Center? Can prospects, courtesy or non-members login? Why can’t I view (see) my member/rep password? How do I know what permissions my rep has? Why is my member being asked to verify their identity when creating a login? How do I invite my reps to create a login account and access the Member information Center? This page was last modified on 19 April 2019, at 07:02.